5 Signs Which Indicate That Nick Jonas Is Going To Be A Perfect Hubby! 5 Signs Which Hint That Nick Jonas Is Going To Be A Perfect Hubby For Our Desi Girl! Priyanka Chopra and Nick Jonas are all set to make it official very soon, and we don’t want to wait any longer. Ever since the duo got engaged, they have been giving us some major relationship goals. I mean their cute PDAs have love written all over them. Now, I have been hearing this since eternity that “It’s God who chooses the right one for you”. Initially, I didn’t use to believe it, but after watching Priyanka and Nick together, I think I do! As far as my knowledge of a healthy relationship goes, I think there are signs which indicate that your beloved is the perfect match for you. And today we are going to talk about the five signs which indicate that Nick Jonas would be the perfect hubby for Priyanka! , the duo will solemnise in Jodhpur’s Umaid Bhawan Palace on December 2. And I know you cannot wait to see the diva in a beautiful bridal avatar. 1. Priyanka and Nick hail from entirely opposite cultures, but despite that this gentleman wholeheartedly made his relationship official with Priyanka via a roka ceremony. Isn’t it cute? 3. Nick has not been shy in showing his affection towards PeeCee. He is smart, funny and lovable. Just like a good would-be should be! Take a look for yourself at his Instagram comments, if you don’t believe me! 4. 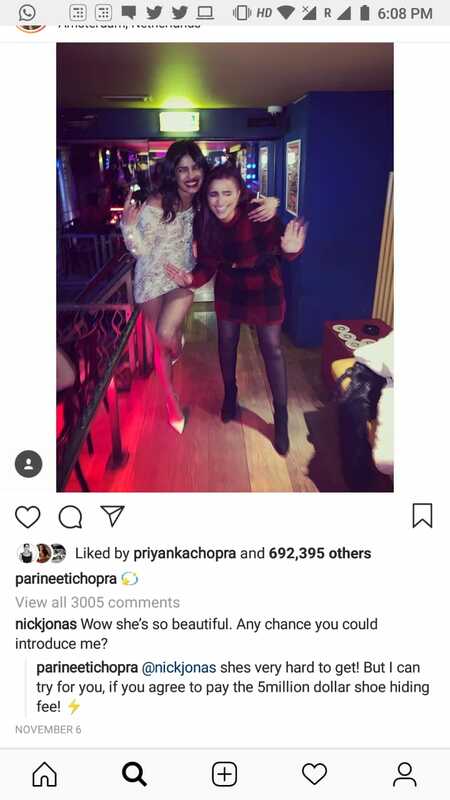 PeeCee’s mommy was all praises for Nick Jonas. She stated that he is kind and gentle. Well, the pic below has sweetness and love written all over it. What else can you expect from your beloved? 5. Last but not least, Nick Jonas loves his family! I mean his Instagram handle is a proof that he is a family person. Lately, in an interview with Jimmy Fallon, he mentioned that he and Priyanka have this thing in common! After reading the aforementioned, we think that PeeCee and Nick will make a really awesome couple, don’t you agree? Do You Know Anushka Sharma Was Dating This Guy Before Ranveer Singh And Virat Kohli?